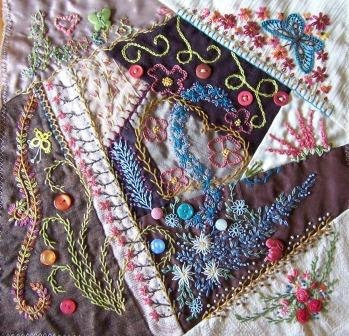 Spring has arrived and this seems an appropriate time to introduce Block No 2 of my crazy patchwork project. Block No 2 is all about flowers. I love flowers! I love looking at flowers, smelling flowers, drawing flowers, growing flowers, embroidering flowers - everything about flowers. My love of flowers started when I was a very young child and we stayed with our paternal Grandmother. (of ginger biscuit fame - see above post) She often baby sat us when Mum was busy helping out in Dad's butcher shop business. In later years when we were a little older, we stayed with her for an extended period while Mum and Dad took an overseas holiday. She had a typical country garden with standards such as snapdragons, sweet peas, pansies, daisies, lavender, roses and lots of other beautiful and perfumed plants, fruit trees and flowering shrubs. She always had great big vases of flowers around her huge house. Her house was an old army hospital, a remnant of the army's presence in Oakey during the 2nd world war. It had many rooms and lots of lovely nooks and crannies - ideal hiding places to play our favourite game "hide and go seek". 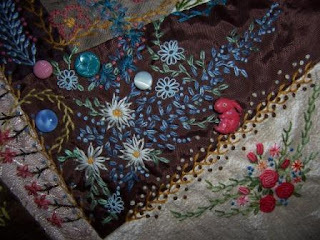 The top left embroidery reads " I love flowers" Can you make it out? It is not such a good photo, I'm sorry. The heart is done in Robyn Ginn's stitch, row of roses. Basically a coral stitch surrounded by a lazy daisy stitch. The text is done in every variety of stitch I could think of that would fit in with the relevant letter. Then there are some little rosebuds underneath done simply with a fly stitch and a lazy daisy stitch. Gosh, I am sorry about these blurry images! The blue butterfly is a bit of a cheat. It is broderie perse to which I have added some extra embroidery. The hollyhocks under this are once again the "row of roses" technique. I just love this stitch. 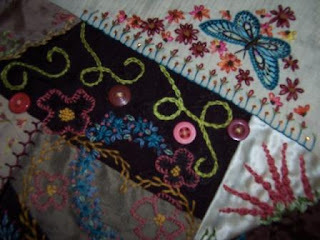 There is a simple feather stitch heart in the centre of this block to which I have added a very elaborate swag of lazy daisy flowers filled in with colonial knots. The large white daisies are of course lazy daisy stitch but elongated a bit. The pale blue "flowers" are actually tatted by a friends mother. My friend had a whole bag of these little tatting motifs and kindly passed some on to me. 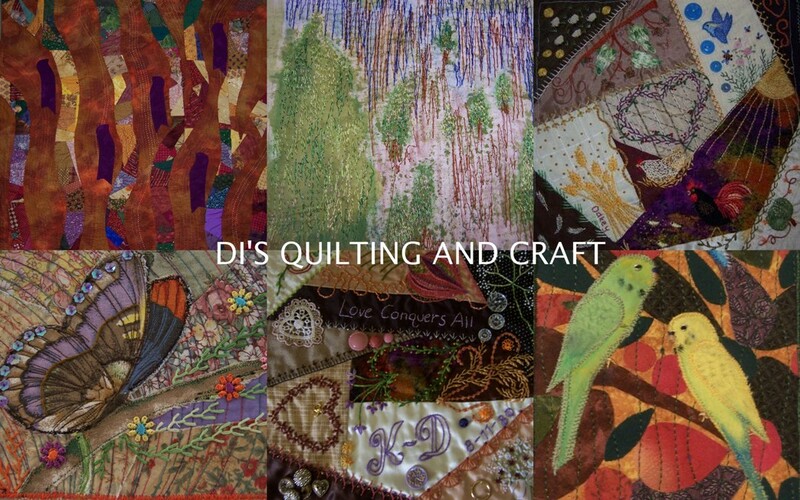 The yellow butterfly in the left of the block is also from this collection. 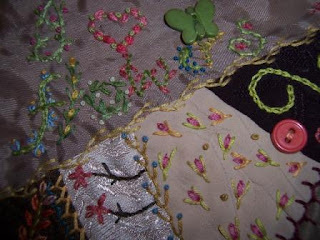 I was very please with how the bouquet of bullion stitch roses turned out (bottom right). The colours are very striking and I was worried if they tied in with the other colours, but I think it worked okay. Sometimes doing a crazy block is a bit like painting a picture, you have to know when it is finished and I think with "the flower block" I may have just gone past the finishing point. Guess I just got carried away with my favourite topic!